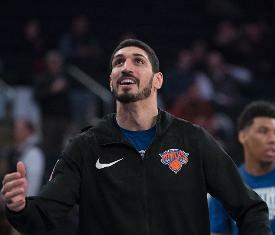 Enes Kanter and the New York Knicks parted ways Thursday. According to ESPN, the Knicks released Kanter after failed attempts to find a trade partner in recent days. Kanter's expiring contract at $18.6 million made trade options a difficult match for the Knicks. With Kanter and Wesley Matthews gone via buyout, the Knicks held onto center DeAndre Jordan. ESPN reported the Boston Celtics, who found Greg Monroe as a midseason pickup last year, could be a prime landing spot for Kanter given their depth issues at center caused by injuries. Matthews, per multiple reports, was headed to the Indiana Pacers in a deal that could be done imminently. The 26-year-old Kanter indicated after Tuesday's game that he played his final game with the Knicks. "This place will always be special to me. It doesn't matter, if I stay, leave, whatever happens," he said.